On 27th March 2010, Aarti, Filipe and Mark left London Heathrow heading for Kathmandu via Delhi. In the early hours of 28th March, Katarina left Kuala Lumpa en route to Nepal. All heading for an adventure, a new experience, a place near the top of the world. In the following posts you will find the story of our trip to Nepal. 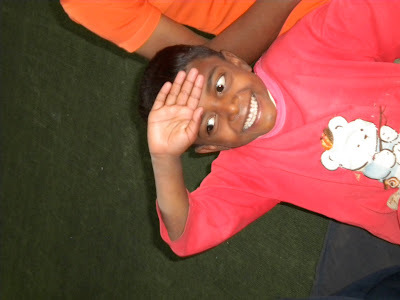 We have posted photos which we feel best express the work and the people we met in Kathmandu and the surrounding area. This trip would not have been possible without your help. Thank you, Thank you. 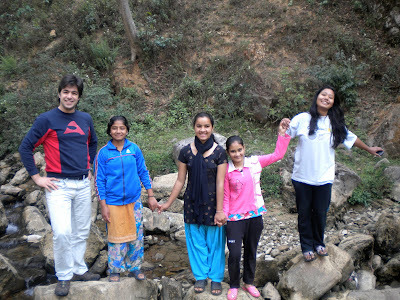 We hope you enjoy the photos and our stories and feel part of the experience of Dynamic Heart Project Nepal. Again thank you for your kindness and generosity. The following poem by Marianne Williamson is the Dynamic Heart Project mission and prayer. And in every heart there is the power to do it"
We took this thought with us to Kathmandu, and never is there a truer place than Nepal to see this poem and prayer in action. When I accepted the challenge of going to Nepal to work with children, I knew that I was going to learn at least as much as I could help. I was right. When we arrived in Kathmandu, the sun couldn’t shine bright because of the smoke curtain over the city, the poor streets were full of cars, motorbikes, and garbage. Things seemed out of order, the traffic was crazy. This was my first impression. As we started to make contact with people, I found that this was a country where the heart could communicate to other hearts. It was not about hugs and kisses, it was about Love. It’s not that I’ve seen people showing too much affection gestures towards each other, it was the warm way that people communicated with. The name Ghar Sita Mutu makes all the sense: A house with heart. That’s what I would call to Nepal. It was a country where I felt at home. The work with the children from the different centres and schools was fantastic. To a western person, it’s amazing how discipline and respect are still valued by the children and young people in Nepal. They could teach a lot to the western children. Even if we were aware of the difficult life situations of many children, I could only see them as special children, rather than heartbroken, by all the love, energy, awareness and great intentions that they shared with me. If my inner child was wounded, these children have shown me that it’s possible to change our situation and fight for what is really important. For all of these reasons and for many more, I feel that I’ve got a family in Nepal. I have been deeply humbled by my experiences in Nepal - so much so that a part of me still remains there even on returning back to England. It was in Nepal that I came to really understand that one undertakes two journeys in life - the physical journey of the body through time and space, and the internal journey of the heart and soul which at times can be more challenging. There are moments in one's lives when we are deeply touched, inspired, or enriched - for me one of those moments was at Ghar Sita Mutu - "The House With A Heart" and does it have HEART!! It was here that Beverly's Children taught me - they have been my greatest teachers and it was here that I was proud to be their student gaining a wealth of knowledge from the wisdom of their tender and sometimes wounded young hearts. Despite what many of them have been through they still knew how to remain open, to share, to forgive, to be compassionate, to radiate joy, to laugh, to play, to dance and to love.They welcomed me with their beautiful smiles and embraced me in their loving hearts and into their big family as if I always belonged with them. These Children taught me to look deep within my own heart where I found a joy that I never expected but one that I believe every human has the potential to feel if they too looked deep inside. I feel that we will remain connected forever [despite the physical distance between us] and for that I am eternally grateful. Beverly - you have given so much and you have taught me about unconditional kindness. You show that kindness in not a process in the head, or a though but kindness is lived out in what you do. Thank you for teaching me to be aware and to be awakened. Nepal felt like a very special land. A home to special little people but was also a cradle to heart wisdom that so lovingly enveloped us. I deeply felt this joyful wisdom that was shared from heart to heart without limits, differences or discrimination. It was permeating everyone and everything it surrounded. It was feeding and balancing the warm love that was twinkling in little ones eyes. When children looked at us, we felt their appreciation and love They could sense we were there for them and they embraced us unconditionally. They offered us their acceptance, their love - everything. Their little souls were bejeweled with precious, priceless qualities, that made them richer than most of the people I know. O A lot of the time this was balancing out the extreme poverty or suffering they had to endure in their young lives. Their hearts were smiling, though behind the sparkle of their eyes one could sense some of them may have a heavy burden to carry. It was amazing to see them work so hard and so well, it was rewarding beyond words to see them benefit and brighten up from spending time with us. For me, I treasure the time they and their teachers shared with us every moment of every day. A part of my heart and soul is still and probably will stay forever in Nepal. When we were leaving they looked into our eyes and asked us to come back with great sincerity and hope in their hearts. Inside mine, I felt the same. I would not want to let them down like they were let down by many in their young lives. It was obvious how much it would mean to them if they saw us again, and it was clear as sky how much all of them and what we shared meant to me. They are a part of me and will stay with me forever. Hopefully we can make it back one day. Ghar Sita Mutu truly is a home with a huge heart. It is housing little gems that make their home sparkle beyond this world. Their brave hearts carry love, wisdom and warmth that are limitless, extending beyond boundaries of our daily existence. It touched our hearts and now we are linked in eternity forever. So are all of you, who supported this project and helped selflessly, now linked with invisible cords of this unique experience, it could not happen without you. Aarti, Mark and Fillipe, without you this experience would not have the life and shape that it had. Finally Beverly, without your enormous heart and generosity of spirit, your home for children and this project would not become the enriching and precious reality we had a privilege to experience. 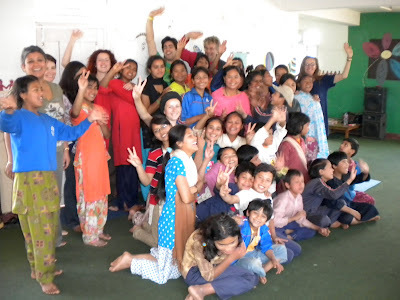 Nepal and the Dynamic Heart Project started with a dream 3 years ago, when I was told very clearly that the children were waiting for Dynamic Theatre. I was told in my dream that the children, which I understood also meant the child within every adult, knew about Dynamic Theatre, and again were waiting for us. Now three years on that dream was realised in Kathmandu and Nepal. That dream could not have happened without the support of everyone involved, to which I am truly grateful and give heartfelt thanks for the time, the donations and any help however big or small that you have given for us to be able to share Dynamic Theatre with the children in Nepal. You were with us every step of the way. Aarti and Katarina thank you for having faith in the vision of the work, even though at times tested by the cockroaches scampering across your bedroom floor in the middle of the night. And Filipe, I think little did we know the full potential of what we created back in 2003 when Dynamic Theatre first came into being. Looking back I believe it is the love in our hearts that enables us to be the dutiful and respectful guardians of Dynamic Theatre. This journey of the heart alongside Dynamic Theatre and the Dynamic Heart Project would not have been possible if we did not share the same vision of making a difference in the world, thank you for sharing the journey and for believing in the dream, long may it continue. As time got closer for us to go to Nepal I wondered how the work would be, how the children would be, I had heard so many stories of the children, not only as orphans and child labour but also as children caught up in the recent civil war used as gun runners and put on the front line. How would they be and how would they react to Dynamic Theatre? When we first landed and entered into Kathmandu I was a bit overwhelmed by all that it was, all the dust, the pollution and lots and lots of people everywhere. When we stopped in traffic I noticed all eyes were in our direction, and the children smiled and shouted "hello" and when we answered back they ran off laughing. I later found out that westerners are known as the "hello people" as very often it's all they say and it's quite a game for children to share with their friends that they said hello to a "hello person". When we met the children from Ghar Sita Mutu it was like meeting friends, the warmth and the smiles really made Ghar Sita Mutu live up to it's name of being a house with a heart. As we got to know the children more and they us I got to understand what it means to be with an open heart, these children whom have lived through events none of us would care to experience in a lifetime show nothing but kindness and a desire to help each other. Of course at times the scars can be seen but for the children the light of their souls shines far brighter. We travelled out of Kathmandu to work in another home for 3 days, we were again greeted by smiling faces, laughter and singing. The gift of these children is their desire to make their world a better place, I think most of us agreed that a lot of western children could learn so much from the children of Nepal. They do not care if their trainers are Nike or Addidas, they are just appreciative of having something to wear on their feet. It soon became clear to us all that it was the children who were the true teachers, we had just fallen asleep somewhere along the way. On occasion I was unable to say anything as I was overcome with emotion as to the depth of feeling and openness the children showed towards us. Many times I heard the children saying how they wouldn't forget us and how grateful and how much they appreciated the time we had spent with them, for them that small amount of time was precious and worth far more than any X-box or Playstation, for me there wasn't enough time, I was just pleased we were able to give what we were able. Of course we did not expect to change their lives in 2 weeks but my hope is that somehow we made a difference, maybe we didn't change their lives but they certainly changed mine. It's said that home is where the heart is, so be sure that you will always find home in Nepal. To all the children we met in Nepal - thank you, it was truly an honour and a gift to meet and share with you. I look forward to seeing you again soon. To all who donated, in whatever way, time or money, thank you. 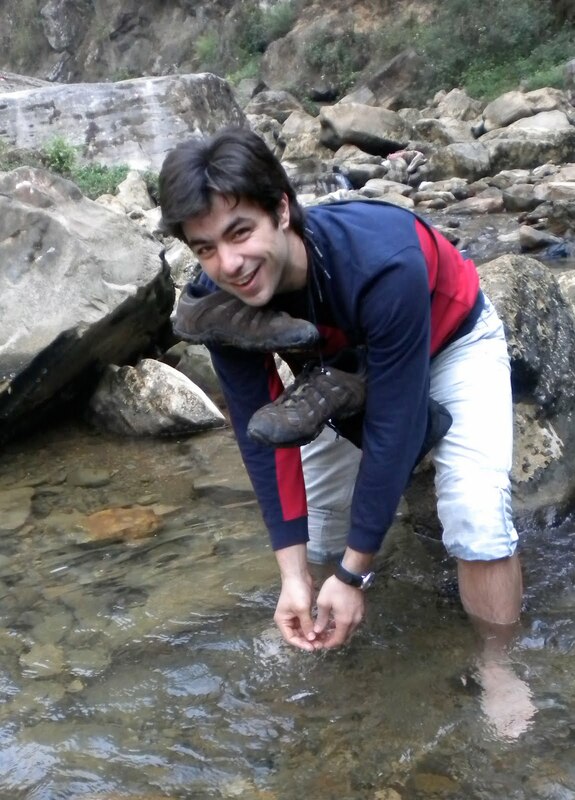 I hope you enjoy the following photos of Dynamic Heart Nepal. This is a typical street scene from Kathmandu, to the western eye it may look uncivilised and its people in need of rescuing. Whilst the city is very polluted by the continuous burning of plastic for the fires for cooking and a form of heating in the winter, do not be disillusioned the people of Kathmandu and Nepal do not need rescuing, help, yes. It is almost impossible to feel alone in Kathmandu as there are so many people, a lot who want to sell you something, but behind the selling is a warm smile. Despite the atrocities of the civil war, and some of the hardship of daily living, look close enough and listen in-between the hustle and bustle of the cars, buses and bikes, and you will feel the beating of the true Nepalese heart, a heart which is strong and able to guide and nurture its people and as solid as the mountain range that runs through the veins of this magnificent country. If you want to come face to face with your own heart, then come to Nepal and know its strength reflected back to you in every face you see. Beverly Bronson (pictured) is the creator and owner of Ghar Sita Mutu, if it wasn't for her vision and compassion these children would not have the lives they have today. Thank you Beverly for being an inspiration to us all, with just a little bit of faith, a vision, and a big heart we can achieve anything we set our hearts to. All we need to do is take the risk and jump into the dream. By involving all the children from Ghar Sita Mutu everyone one benefits from introductory games. Our first day with the children was spent outside in the garden making theatre games and stories. Our intention is to always be as actively involved as possible to be able to meet the children on an equal level, to enjoy and have fun whilst offering a safe container for children to explore and grow. Every Saturday a group of volunteer vets go to Bhouda Gate in Kathmandu to take care of some of the stray dogs. Although some of the dogs can be a bit unfriendly to some people, they seem to have a sixth sense about the volunteers. They freely let them pick them up and stand patiently while they are washed with antiseptic shampoo and a general check-up. The volunteer vets also travel to other parts of the city on a weekly basis as well. Everyone gets a little help in Nepal. Filipe worked with the younger children in this session to inspire them to create a drama all about the colour red and how they would attract the other children to come and join the "red group" By helping children to believe in their imagination we help to create the makers of change for tomorrow. Think of it like this, everything you see in this photo started once upon a time in someone's imagination. Dynamic Theatre is all about remembering the happiness and wisdom that is already inside of you. Through active imagination and play making we build confidence and encourage the children to go beyond the boundaries of who they think they are to knowing their fullest potential. Filipe - lead singer/guitarist, Mark - supporting vocals and part of the audience, Aarti & Katarina - backing singers/dancers. We had a great afternoon sitting in the garden with the children of Ghar Sita Mutu singing and playing music, learning from each other Nepali songs and western music. Being a talented singer Filipe was able to share his passion for music with the children who just loved to learn new songs, as well as Filipe learning to sing part of the Nepalese national anthem. Schooling is not free in Nepal therefore a lot of parents are unable to send their children to school. Ghar Sita Mutu offers a free 2 hour class, monday to thursday, in basic education. Nabina is supported by Ghar Sita Mutu to continue her valuable teaching, class age range is from 4 to 13 years old. A lot of the 12 and 13 year old girls attending the class are already working as housekeepers and servants in order to support their family. Nabina explaining to the class how we will work and play with the games of Dynamic Theatre. At just 4 years old this little girl was able to play the game of "magic skittles" and tell everyone how she felt the green skittle would make her strong. Each skittle represented a different quality, green = strength, yellow = courage, and pink = love. The wisdom that came from these children is beyond words. Most of the time the children of the daily class are only able to draw and write whilst attending the class, all materials stay behind. With some of the money raised we decided to buy each child a drawing/writing book and coloured pencils, so they could continue drawing and writing at home. For many this was the first time they had something of their own. Thank you for contributing to the continued creativity of these children both in the classroom and at home. The local children going home from their morning class at Ghar Sita Mutu. We requested that some of the donation money we raised go towards buying books and writing materials to support the children's learning and the continuation of this free class at Ghar Sita Mutu. The average annual wage in Nepal is between £150 - £200 per year. It is considered to be amongst the poorest countries in the world, and yet it is rich in so many other ways. Even though by Western comparison the standard of living is very low, we actually saw and met more smiling and happy people in Nepal than we sometimes do in the so called western civilized world. CWIN is a Nepalese based organisation helping for the rights of children to be children. It was a wonderful opportunity for us to be invited and welcomed into the home and hearts of the children at CWIN. Introducing ourselves to some of the children at CWIN Peace Home in Panouti. We all have a story to tell of who we are and where we come from, sharing our story gives us a sense of belonging and a way to reach out to those we are meeting for the very first time. Letting children choose their own story and play builds confidence and esteem, both individually and for co-operating with others. "If you were orange how would you act"
Katarina and her group deciding how to be and present the colour orange. With Dynamic Theatre all you have to do is imagine, and then anything is possible. Aarti, Filipe and Katarina introducing themselves and Dynamic Theatre to the local school children. Laughter and play is an important part of Dynamic Theatre, it helps to keep the imagination fresh and active, whatever your age. A Dynamic Theatre game of acting as if you are a colour. Dynamic Theatre makes you smile! This is our group goodbye after 3 days staying and getting to know all the wonderful children and staff who lived here.